This technical note will provide step-by-step instructions of how to batch edit a set of date fields in Lexbe eDiscovery Platform. 1- Browse & Search. They are column field types, and you can use the section 'Fields>Show Fields' to select which date fields you'd like to display in the main table. Date Received >Lexbe e-Discovery will extract and use the ‘Date Received’ from the emails to be displayed as a field, unless the original was in blank. 1-Coding in Excel & Upload Metadata: Power and Account Admin users can use Excel spreadsheets to edit most fields in Lexbe eDiscovery Platform, restore email families in an Excel spreadsheet, upload that spreadsheet to the applicable case, and have the metadata fields in Lexbe be automatically updated. You will create a custom Excel spreadsheet with the extension file name '.lexbemultidocupdate.xlsx'. (e.g. Lexbe.lexbemultidocupdate.xlsx). 1- In the Management>Manage Custom Doc Fields page, first set up one section to contain and organize your date fields, by clicking on the 'Add Coding Section' hyperlink. 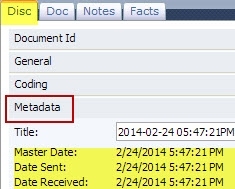 Examples of section names could be ‘Editable Master Date'. You add a section by clicking on ‘Add Case Section’ and entering the section name. 2-Coding fields are added in a similar fashion. Please click on ‘Add Coding Field’ and create a text box and use the 'MM/DD/YY' format to sort dates correctly (e.g. Format String). In the example below, we manually entered the same dates from the 'Master Date' to the custom field 'Editable Master Date', using the 'Edit tab'. This tab allows you to code, edit the Built-in fields and Custom Doc Fields (multiple files and one field one at a time). 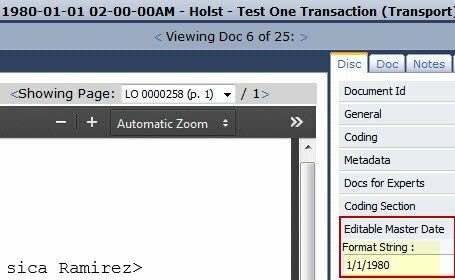 Please note that your custom fields are also editable from the Document Viewer page>Disc Tab (one document at a time). We also offer eDiscovery Consulting and Technical Services (billable hourly) if engaged to support your redaction logs efforts by helping you to code metadata fields for document identification. Please contact your sales representative or our Support Center if needed.